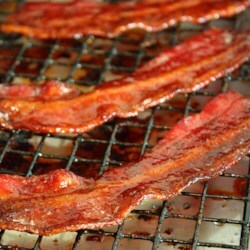 Double this recipe or you will cry because you run out of delicious candied bacon and you will want MORE! Any thick cut bacon works great. I followed another reviewer's tip of doubling the maple syrup the second time I made this recipe. Very good.